Hello friends and listeners to the Catholic Family Podcast. Summertime greetings. Are you high and dry? Or are you soaked from recent downpours? May God grant respite from heat, gentle soaking rains and an end to the persistent forest fires. I hope your summer is a gift and restful for you. The Fox family lives in north-central Arizona. We’re in a town at 5,000 foot elevation so we have a nice, usually gentle four seasons. During the summer, I am assigned by our parish to do a Sunday Communion Service for the Boy Scouts. They meet further up in elevation – perhaps at 6,000’, in a place called Camp Geronimo. The camp is in a highly wooded area, and with some steep mountains rising around them. The mountainous rise has a flat top and is called The Rim — it surrounds this area for dozens of miles. It’s up at about 7,500’ elevation. I love going to Camp Geronimo. 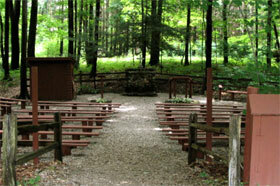 They have an outdoor ‘Catholic chapel’ in the woods. I’m able to go to our parish, pick up Jesus in the Blessed Sacrament at about 8:00 AM, say a rosary on the way up to the camp. And I’m setting up for the liturgy about 8:50 AM with a planned 9:15 start. I hate to use the words ‘warm up,’ but I do a sort of a warm up. First, I put on some hymns or praise and worship music while I set up the altar area, get the books ready for the readings of the day, pick two lectors, etc. When all is in readiness – I turn off the music and come out to stand in front and near the Scouts and their leaders. -First — can anyone tell me what the difference is between a Mass and a Communion Service? -Second — can anyone tell me what the difference is between a priest and a deacon? -Next — today’s readings have to do with repentance. Any idea what the word repentance means? –What do we have to do to become a saint? –Do you have any pictures of saints in your bedroom? I do about 10 of these sorts of questions. I often have little gifts, .e.g. CD’s or books or holy cards or Sacrifice Beads to give to those who answer correctly, or to Scouts who have tried to give a good answer. The sad thing is, dear friends – I don’t get a lot of correct answers. And as the young men come forward for Holy Communion, some fellows reach to actually take (almost grab) the Eucharist out of my hands. Many of them don’t have much of a clue about their faith or about the proper way of receiving Holy Communion. This sharing that I’m doing with you in this column is to tell you that our faith-walk with our young children is going pitifully. It’s pretty abysmal. Parents are mostly to blame because we’ve now accepted three generations of poorly catechized Catholics. Many if not most adults are willing to ‘practice’ Catholicism but not to live it or ever talk about it in the home. We have adults who don’t KNOW what it means to be Catholic — many just know what to do to act Catholic. They come to Church once a week (some even less). They dip their fingers, they look to the priest or deacon to ‘entertain’ them with a good or funny homily. They get a ‘wafer,’ and then a bulletin and they go home. It’s terrible. We are becoming the Europe of the new world of faith. We must make up our minds that there is nothing more important than God in our lives. And if God is most important, then we need to act like it. We cannot be passive about this faith walk that we are on. Be careful if you send your young boys to Boy Scout camp in Arizona, because there is a deacon there who may help them to see that they are not being faith-formed the way that they ought to. They may be asked what it takes to become a saint. And if they don’t know a simple answer to that question — their compass point is way off the mark. Then, as a Boy Scout, I have many fond memories of particularly “Catholic” things. We would go to Mass on Sunday mornings after a campout on the way home, stopping at some Church along the way where the Catholic scouts and adults would go to Mass in our uniforms, because we were traveling. At long-term camp, we would go to our respective religious services (at the time, I know there were Catholic, (mainline) Protestant, evangelical Christian and non-Christian). At least one year we only had a Communion service, and I remember that being kind of disappointing, although I surely didn’t have a well-formed theological understanding of why I ought feel like I was missing something. One year, the Bishop was there to celebrate Mass: Miter, Crosier and all! In short, I want to commend and encourage you in your ministry to the Scouts. Even if many of the boys don’t seem to really know much about their Faith (they may not!) that doesn’t mean that you’re not having an impact on them that could last a lifetime. I think there’s something about Scouting in particular which encourages even otherwise uninterested boys to see the importance of the faith. Whereas (unfortunately) when so many people go on vacation, they just skip Mass, the witness of making a point of going to Mass, even when camping, is irreplaceable. Finally, the presence of the Ministers of the Church at the service of the Scouts is an acknowledgement of how important the faith should be to the scouts. Hi Chad. Greetings and graces. Thanks for taking the time to write a reflective email on this column about serving the Scouts at camp. The primary thing I’ll react to in your email is the good reminder that we mostly will never know in our lives who and how we’ve been a factor in people’s faith journey. Hopefully for their betterment by our prayers, words and actions. The other issue is that so many of us aren’t up in arms about what is happening in the area of the faith formation of our children. One statistic says that 80% of our kids stop most all faith practice by the time they are sophmores in college. Other young people ‘walk’ from Church after Confirmation. Sad. So sad. Thank heavens for good Newman Centers and for organizations like FOCUS missionaries on campuses.